So, it seems that for the immediate future, Disney’s stroll through its back catalog has taken a break. With Beauty and the Beast having come out in March, our big Disney movie for 2017 has come and gone. That doesn’t mean things aren’t in the works, though. A number of other Disney fantasy movies are in various stages of pre-production. One specific bit of news though is that Disney is apparently courting Skyfall director Sam Mendes to direct the live action iteration of their film Pinocchio. Ah, Pinocchio. The book by Carlo Collodi has become an unexpected favorite of mine. The book is darkly hilarious and crazily creative in an almost random way. Despite being rather didactic, I find it very entertaining. Disney’s animated movie on the other hand . . .
Not gonna lie. It’s not my favorite (though, that didn’t stop me from buying a copy of the recent DVD release. Why? Because I’m a sucker, I guess). Truth be told, when it first came out it was hardly anyone’s favorite. While Snow White and the Seven Dwarfs was a big hit, Disney initially lost money on Pinocchio, and Fantasia. Crowds just weren’t digging the different stuff they were trying in those films and only managed to recoup their losses with Dumbo. Mind you, this is before they started a line of theme parks and essentially gave themselves a license to print money. So yeah, this film is likely going to happen even if it isn’t with Mendes at the helm. The news that he was in the running was enough for pop culture website The Nerdist to do a fan casting. I’m not as interested in casts as I am in stories, though. And the thing that interests me about the Disney remakes is that almost every one of them has used something from earlier versions of the story that was not present in the animated films. There was the reference to the hazel branch from Grimm and the lizard footmen from Perrault in Disney’s Cinderella. There was the myth about the elephants creating the jungle in The Jungle Book. Let’s not forget the theft of the rose from Beauty and the Beast. Even if it was a small detail, I appreciated it. But now the question becomes: What extra bit of the source material could make its way into Pinocchio? Well, I’m going to create my own wish list, but first let’s set some reasonable expectations with Things that will be in the Pinocchio remake whether I like them or not! The “Wish Upon a Star” scene. Yes, it’s amazingly maudlin and it takes away some of the humor present in the story with Pinocchio being a sentient log. But that scene and the song that accompany it are iconic Disney. So iconic that the song gets used for things that aren’t even Pinocchio-related. It’s not my favorite addition to the story. It actually plays into my theory that the darker a story was, the more Walt and company made it sappy and sentimental. But I will patiently wait through this kind of syrupy sweetness for the sake of the dyed-in-the-wool Disney fans. Jiminy Cricket’s co-starring role. People just love that bug. If you watch that movie again, you’ll notice he’s not a very good conscience, but people still love him. They love him so much that people look at me in shock and horror when I tell them that Pinocchio squishes the Talking Cricket out of anger in the book. It doesn’t even get better when I tell them he comes back with no explanation later in the book (#Pinocchiologic). People even loved Jiminy back when the movie was bombing at the box office. That’s why Disney brought him back as a presenter for some of their featurettes and shorts later on. So, you can bet that Pinocchio’s rather flawed insectoid conscience will be back for the remake. The Scary Donkey Scene. In the book, Lampwick’s complete transformation into a Donkey and Pinocchio’s partial transformation into one were played more for laughs. There was this whole scene where they both try to hide their donkey ears from each other. Yet, ask almost any Disney fan and they’ll tell you that Lampwick’s transformation into a donkey is one of the most traumatizing scenes in the Disney canon. And it’s often the scarier scenes that people remember best from Disney movies. Perhaps because they’re so rare. So, I can’t see this scene changing for the remake. Monstro the Whale. Honestly, I just can’t see them changing the whale back into a giant dogfish. I just can’t imagine that happening. It’s another one of those iconic Disney things. Now that that’s out of the way, let’s make a new list! Here we have The Fairy Tale Geek’s wishlist of things to be brought into the new Pinocchio remake. An Expanded Role for the Blue Fairy. In Disney’s movie, the Blue Fairy is a magical benefactress. She brings Pinocchio to life and lays out the conditions for him to become a real boy. She doesn’t appear much after that. In the book, she doesn’t bring Pinocchio to life. He’s already alive even before being carved. But she does have a bigger role. She saves Pinocchio from certain death when he gets hung from a tree. Pinocchio also stays with her at one point and even considers her his mother. I know that movies are limited in length, but that’s something I’d like to see. It’s so rare that you see Pinocchio depicted as having any kind of mother figure. Besides, in 2017 it seems like a good idea to give a bigger role to one of the few female characters in the story. The General Weirdness. To tell the truth, despite some of the more fantastical parts, Walt and company really grounded the heck out of the movie. Just having magic as an explanation for Pinocchio being alive did a lot of it. As I said before, that part is probably not going to change. In general though, the book was like a Wonderland story if Wonderland looked an awful lot like 19th Century Tuscany. Maybe with less wordplay than a Lewis Carroll story (not sure, it could have been lost in the translation) but almost as much randomness. But I would love to see more of that stuff. Maybe the Green Fisherman could make it into this version. Or maybe the animal-populated town of Fool’s Trap. Or maybe we could see the Blue Fairy’s snail servant and coach drawn by white mice. 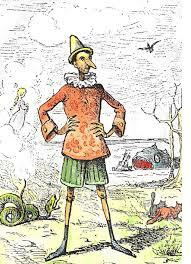 It would just be nice to see some of the surrealness brought back into Pinocchio’s world. The Great Puppet Theater. This one’s the ultimate long shot because it would mean changing an existing scene from the original film. But I would like to see a more book-accurate version of the Great Puppet Theater. In the book, Pinocchio sells his school book to see the puppet show and there he meets some other living puppets and is nearly thrown into the fire by the showman who’s named Fire-Eater (or Mangiafuoco in Italian). In the movie, Pinocchio is tricked into joining the puppet theater by Honest John (the Fox) and Gideon (the Cat) and ends up being held captive by the puppeteer Stromboli. None of the other puppets are alive. Now, like I said, they’re probably not going to change the “wish upon a star” origin story. 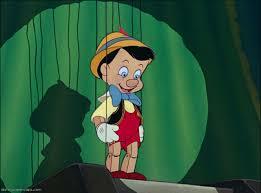 Still, it would be great to see Pinocchio meet other living puppets. It would have to be recontextualized for Pinocchio’s Disney origin, though. Perhaps they’re other puppets who’ve been brought to life by fairy magic and never figured out how to be “brave, truthful and unselfish” so never won the chance to be real. Maybe they’ve been living puppets who’ve been like that for nearly a hundred years and could serve as a bit of a warning for Pinocchio that he needs to try harder to be good. Of course, they’d also have to try something different with the “I’ve Got No Strings” song. This time, I imagine it being sung by the other living puppets as Pinocchio watches in the audience. So, that’s my wish list. Even if Disney doesn’t make any great changes for the remake, there will still be some Pinocchio options out there. Last I heard, there’s still a Pinocchio movie in the works at Warner Bros. with Robert Downey Jr. and Ron Howard attached. Also, Italian director Mateo Garrone is working on a version of the story. But I’d like to hear from my readers about what they’d like to see added or changed during the Mouse’s continued walk down memory lane. What stories would you like to see with some of their literary counterparts added or what could be changed to make the movie just better in general. Personally, I’ve also got some suggestions for both The Sword in the Stone and Peter Pan but those are best saved for another day. So, here’s the list of upcoming movies from InkGypsy’s blog. Let’s hear what you’d like to see Disney’s second chance with these stories. Once Upon a Pixel: Folklore and Myth in Super Mario Bros.
Hey, everybody! It’s been a little while. Between work and other hobbies, folklore research and posting got waylaid a little bit. Speaking of other hobbies, I have been on a huge retro gaming kick lately. Now, rather than let that waylay me any further, I thought I’d try to use it. 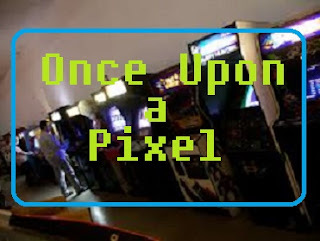 Now, here in my seldom used column “Once Upon a Pixel”, I’m going to try and pinpoint some of the mythical and folkloric inspirations in video games. And where better to start than with almost everyone’s favorite Nintendo icon: Super Mario? Ah, good old Super Mario Bros. It was a major staple of my gaming youth. It’s also one of the most consistently replayable video games out there. Mario wasn’t always the Mario we know today, though. He first appeared as Jumpman in the game Donkey Kong, in which he was a carpenter who had to save his girlfriend Pauline from a giant ape. He was then spun off into the game Mario Bros. in which he gained a brother named Luigi and was turned into a plumber to fit the underground world of the game. However, it was when Super Mario Bros. launched in which Mario and Luigi were given their own fantasy world of the Mushroom Kingdom to play in that things took off and folklore influences came into play. Almost every fantasy world has some basis in either the real world or mythology or both. The Mushroom Kingdom is no different. (Note, because I try to be careful about image copyrights and Nintendo is known to be fiercely protective of their copyrights, this post will not use any images from the games and will instead link to outside sources for that). One of the common things you’ll find in a lot of mythological sources is a tendency to move between worlds by either going up or going down. Whether it’s moving among the branches of the world tree in Norse mythology, travelling up to the top of Olympus or down into the Underworld in Greco-Roman myth or just travelling to another world by going down into a well in the Brothers Grimm story “Mother Holle”. And you will find very few games that utilize this idea quite as much as Super Mario Bros.
Now, when it comes to going down, it’s easy to point out how Mario does it. With the Mushroom Kingdom’s ever present pipes. The pipes here are our equivalent to the well from “Mother Holle” or the rabbit hole from Alice’s Adventures in Wonderland. The connection is probably most easily seen when it’s used for the Warp Zone in Level 1-2. But how do Mario and Luigi travel upward? That’s right, they do it with vines! When I was young, I even had the tendency of referring to these as “beanstalks” because they reminded me of my favorite fairy tale. And true to form, they often took Mario and Luigi to a place above the clouds. That’s how it often plays out in the games, but the connection between the pipes and the rabbit hole from Alice in Wonderland is probably best supported by the opening of the (non-canon) cartoon The Super Mario Bros. Super Show which shows the Mario Bros. travelling to the Mushroom Kingdom from the “Real World” (notably Brooklyn) via a shower drain. Since the Mario series was originally created in Japan, it seems pretty easy to assume that some Asian folklore would definitely have undercurrent in the series. And the easiest place to see it is with the Koopa, the turtle-like enemies from the Mario Bros. series. The Koopa first appeared in the game Mario Bros. as Shell Creepers (at least in America. I’m not sure what they were called in Japan). Now, having enemies that are evil turtles may seem a little strange. However, Japanese folklore has a monster that frequently resembles a turtle. That would be the kappa. Kappas are creatures that have, beaks, webbed feet and turtle shells, as well as an indentation on their head that must always remain wet. Their known for pulling pranks that range from the rude (looking up women’s skirts) to the sinister (drowning people). They can be appeased by being offered cucumbers. Now, other than resembling turtles and very frequently being up to no good, there doesn’t seem to be much similarity between the Koopa and the kappa. However, the similarity between the two names doesn’t seem like something that was coincidental. So, the question is this: Were the Koopa originally created to resemble kappa or did Nintendo notice after the fact and then decide to give them the name as a little nod to their homegrown folklore. 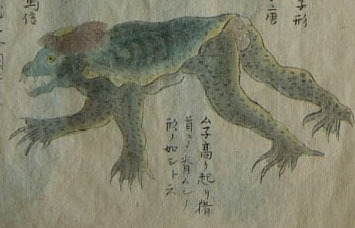 Now, while the Koopa Troopas may be modeled after the kappa, their king may be modeled after a Chinese celestial beast! Despite often troubled history between the two nations, Chinese culture has always had a big impact on Japanese culture. 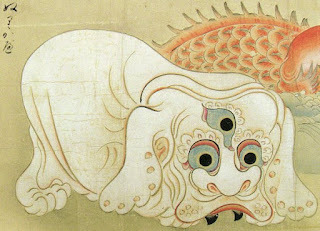 In Chinese culture, there are four celestial beasts that correspond with the four directions. There is the Azure Dragon to the East, the Vermilion Bird of the South, the White Tiger to the West and the Black Turtle of the North. Many mythological beasts are combinations of these four animals. 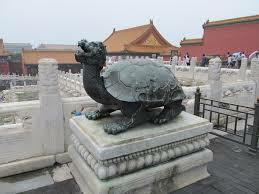 One of them is the Longgui or dragon turtle. The creature is often depicted as a beast with the body of a turtle and the head of a dragon. This is a combination that, you have to admit, kind of looks like Bowser. The thing is that the Longgui is usually depicted as a positive force that symbolizes courage, determination, longevity, fertility, power and success. Bowser is usually not such a positive force. Though, you could argue that he’s still associated with power (especially if you’ve played Super Smash Bros.). This one’s kind of an obvious one, but at some point I had to mention the presence of flying, shape-shifting raccoons in Super Mario Bros. 3. It was always a bit of a puzzler when I was a kid (though we didn’t dwell on it if the game was fun). In Super Mario Bros. 3, there were three power-ups that gave you a raccoon ears and tail and the ability to fly. There was the Super Leaf, which gave you the ears and tail of a raccoon and let you fly if you got a running start. There was the P-Wing, which gave you the ears and tail and let you fly regardless of hum much you ran. Then there was the Tanooki Suit which dressed you head-to-toe like a raccoon, still required you to run for flight but also allowed you to turn into a statue. You see, those raccoons weren’t raccoons. They were tanuki, or raccoon dogs (the name “Tanooki Suit” was only a giveaway if you knew the language). 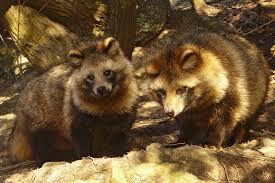 Raccoon dogs are animals native to Japan. However, in Japanese folklore, they (as well as foxes and cats) are often given supernatural powers. The tanuki in Japanese folklore is often depicted as a mischevious trickster. It’s also depicted as a creature capable of any number of magical feats, one of which is shape-shifting. One of the ways that the tanuki is shown to shape-shift is by placing a magic leaf on its head (like the Super Leaf in Super Mario Bros. 3). Though the more supernatural tanuki started as a mischevious monster, he has since evolved in Japanese culture to a creature that’s sometimes shows good traits like paying back debts and encouraging generosity. One major difference between the Super Mario Bros. 3 tanuki and the tanuki from Japanese folklore is that the power in the Super Mario 3 version seems to be particularly concentrated in the tail. The power in the Japanese tanuki is mainly concentrated in . . . well . . . in the scrotum. It’s complicated and actually has more to do with being a symbol of financial prosperity than fertility like you might think. I’m just going to provide a link for future reading. This is another yokai one, as well as one associated with different enemy characters. Starting in Super Mario Bros. 3, there was an enemy called the Thwomp which resembled a great block that would fall from the ceiling. This villain would be used to either crush Mario or block his path. In later games, they added Thwimps which were much, much smaller and would move in an arc to stop Mario. Then, Super Mario 64, the Whomps were added. These creatures were like walls that would block Mario and then try to fall on him. They could only be defeated by being struck on one specific spot on their back. All three of these baddies, especially the Whomps, have their prototype in a Japanese mythical creature called the nurikabe. The nurikabe is a monster that takes the form of a wall to block or misdirect travelers. Going around a nurikabe is supposed to be pointless because it can extend itself indefinitely. The only way to get past the nurikabe is to strike it on a specific spot, just like the Whomps. That’s all I’ve got for now, but before I end this I thought I’d point out one of the sources that was indispensible in writing this post. They’re the videos of a youtuber called Gaijin Goombah. He makes all sorts of videos about video games and culture. Look, here’s one about the folklore connections to the coin ship from Super Mario Bros. 3. Until next time, keep chasing that happily ever after.